LONDON, Ont. - Disgust and extreme disapproval were running high in London, Ont., Sunday after an intoxicated crowd of St. Patrick's Day revellers spent the previous night fuelling a huge street fire and attacking authorities who tried to intervene. While no one was seriously injured as a mob of some 1,000 people took over a residential area popular with students, police said every officer responding to the situation was attacked during an upheaval that could have turned into something far worse. "Never in my 32 years as a police officer have I observed behaviours that escalated to the point where there was risk that individuals could seriously be hurt or quite frankly killed," London's chief of police Brad Duncan told reporters. "We will not tolerate this lack of respect for our community, our laws and specifically this neighbourhood." The scene that drew 65 police in riot gear and 10 firefighters took place on Fleming Drive in the city's east end. The neighbourhood near Fanshawe College was described as a student enclave notorious for its parties and has been the site of previous disturbances, although none as large as the latest one. "It is obvious that the students and residents in this area are under the illusion that they can engage in unlawful behaviour, that they can commit serious criminal offences with impunity and they can reject the lawful authority of police and emergency services personnel," said Duncan. The scene, which Duncan described as a "dynamic, dangerous and highly charged situation," began when a group of revellers took over a CTV news van, flipped the vehicle and set it on fire. 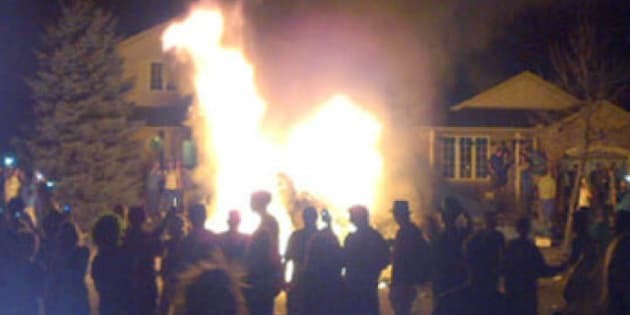 Some police officers later likened the scene to a war zone as party-goers fuelled the flames with furniture, fences and anything else they could find, while pelting authorities with bricks, beer bottles and tires. "To say that I am disappointed and disgusted is an understatement," said mayor Joe Fontana. "We can thank our luck stars that nobody was killed...this is an injury for the whole city of London...they will pay." Eleven people have been arrested so far and police expect to bring in many more as they go through video and witness statements from Saturday night. Police also repeatedly said they would work with residents and college authorities to ensure that the area taken over by Sunday's mob won't see such activity in the future. "It was pretty tense and it was kind of unusual, even for that area," District Fire Chief Jim Holmes told The Canadian Press. One of the biggest challenges for authorities was the sheer size of the crowd, which continuously pelted officers with debris and refused to allow fire crews to douse the blaze. "They kept feeding it. They brought a 60 inch TV from the basement of a house and threw it on. They uprooted some trees, threw it on the fire, mattresses, furniture all kinds of things," said Holmes. "At one point somebody threw a 20 pound propane tank into the fire, so we had to move everybody back before it exploded. Fortunately it did not. "We just didn't want any of the kids to get hurt, that was our big thing. But we couldn't really get in there to do much." Police and fire crews made the decision to stand back to avoid escalating the situation further. "Going in there with that number of people might not have been good for anybody. So we just kind of stayed back and were patient until we decided it was time to move in," Holmes said. Authorities eventually moved in just after 4 a.m. when the crowd had thinned out. Police said the cost of the damage inflicted by the intoxicated crowd is approximated at $100,000. Seventeen police vehicles were damaged from last night's activities. Fire trucks on the scene also suffered some scratches and dents from the bricks and beer bottles that were hurled at the vehicles. A number of smaller fires were also reported in other parts of the city, but none compared to the huge blaze that drew the largest crowd. Some area residents took to social media sites on Sunday expressing their frustration at the havoc wreaked by the revellers and questioned why authorities didn't move in earlier to break up the crowd. But Holmes said police and firefighters had made the right decision in holding back. "From what I saw from being there for the entire evening, if police or us had moved in earlier, it would have created a much more dangerous situation," he said. "There was way too many people to move in and do anything...it wasn't a life threatening situation at that point so I believe the right thing happened."